Recipe: Copycat Candied Bacon Bombs | The Food Hussy! Recently I was #blessed to travel to Birmingham, AL to visit my blogging bestie Plain Chicken. And wow - did that girl show me the town! Well - at least where to eat. One of the places we had to go was the Front Porch and I had to get the Candied Bacon Bombs. 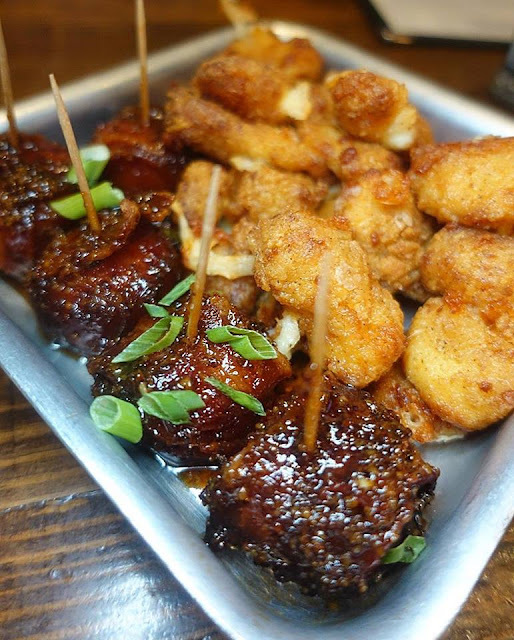 These little gems are buds of candied kielbasa wrapped in bacon and served with flash fried cheese curds. Well they had me at cheese curds to be honest - but I couldn't wait to try these little gems! 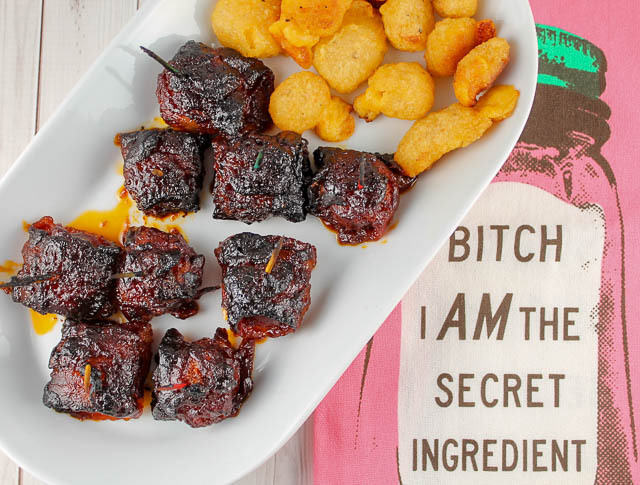 I wasn't exactly sure how to candy kielbasa but i decided to take the idea and make my own version of it - and of course - I served them with cheese curds! It was a pretty fun testing this recipe out! I mean - does anybody want to be my friend and help me next time? I knew we needed some brown sugar - and they definitely tasted of BBQ sauce - so that was my starting point. I grabbed my favorite kielbasa and used the bacon I got from my recent trip to Sugardale Bacon and went to town! So what did I do to make these? 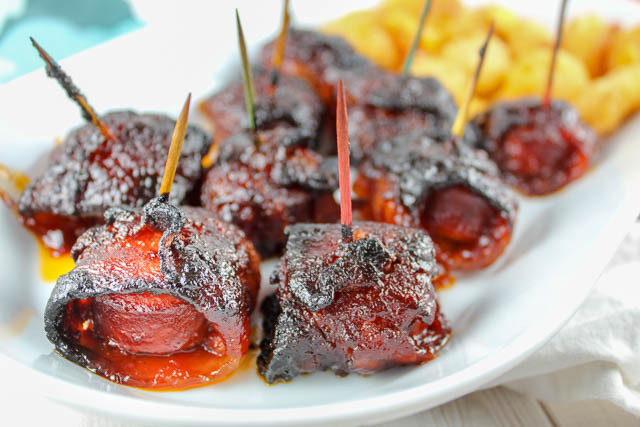 I took kielbasa pieces and wrapped them in a half slice of bacon and then dipped them into my favorite sticky sweet bbq sauce, sprinkled them with brown sugar and baked them! The result was amazing! These little gems were meaty & sweet & zingy & just plain delicious! I've started a new diet since my divorce - it's called "give the dogs half your food so you don't eat it all" - I've lost 30 pounds and they're much happier. They were more than happy to oblige me on this recipe! I was hoping you would recreate these!!!! They are my favorite! Ooo! Going to visit my son and his family in Jacksonville,good snack for me to make with my little chef!!! Great! I hope you like them!!! !